Kiwi Parade Gloss Black 2.5 oz. 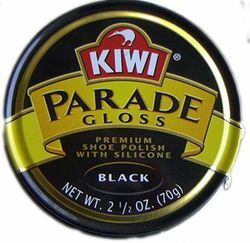 Kiwi Parade Gloss Shoe Polish with Silicone. Gives shoes a brilliant, durable shine. This polish contains more carnauba wax than regular paste polishes which results in a brighter longer-lasting shine and the silicone makes it more water repellent. Available in Black only in this size.